My recent discovery… a cool little tapas place right smack in town! The packed restaurant exudes a casual, happy vibe. Check out their extensive wine list and interesting cocktails. Our Cava Sangria was so lovely, we had 2 jugs! Tapas Club boasts a wide variety of sharing plates and tapas… and they were mostly muy deliciosa! So get straight to business, shall we? Chipirones Con Huevo Frito (Baby Squid with Fried Egg) – Tender Baby squids, well seasoned with a slight crisp batter, so you enjoy a little bit of crunch and a little bit of bite. Served with fried egg (honestly, who doesn’t like a sunny side up 🙄!) and some greens. Nice combination of flavor and texture. 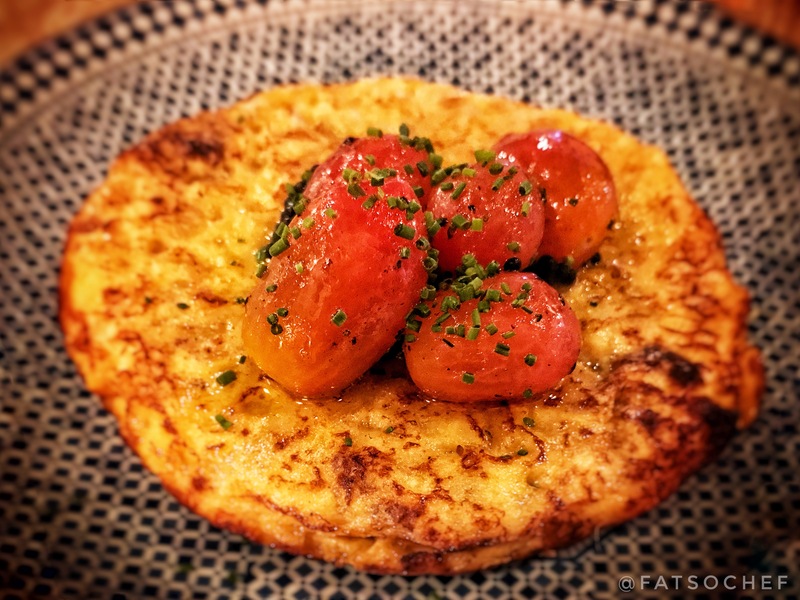 Tortilla de Patatas (Spanish Omelette) – A classic and Tapas Club does it so well too!A good ratio of egg and potatoes. Thick, fluffy and flavorful! Can’t do tapas night without this baby 🥔! Gambas Al Ajillo (Garlic Prawns) – Another classic! Nicely done, a very aromatic garlicky oil flavors the fresh, firm prawns. If only the prawns had been slightly bigger! Champiñones Con Cangrejo (Mushrooms with Crabmeat) – These stuffed mushrooms looked rather plain when they arrived. Wasn’t expecting much but wow! The rich explosion of sweet crab meat against the earthy fungi was terrific! Taste and texture were on point. Sweet, umami seafood and woody mushrooms work beautifully together! And the savory brown sauce they come sitting in was just wonderful.. we wiped down the plate dry! Terrina De Cochinillo (Suckling Pig Terrine) – Bite into an unsuspecting crackling skin and uber delicious tender meat. Well seasoned and moist, with a delectable light sauce. Caballa Con Calabaza (Mackerel with Pumpkin) – The only miss. This beautifully plated fish dish was too fishy for everyone’s liking. Didn’t help that the meat was also dry and tough! Carrillerra De Ternera Con Idiazabal (Beef Cheeks with Idiazabal Cheese) – So tender, so succulent and flavorful in a rich beefy jus. Absolutely delightful! Paella Mixta (Chicken and Seafood Paella)- Perhaps a dash of wine to cut the overwhelming fishy aftertaste from the clams? Or forget about the clams totally! Otherwise, this paella yielded perfectly cooked grains and tender chicken morsels. Fideuà Negra (Squid Ink Noodles Paella)- This was really popular with the group! The broken noodles were flavored and cooked perfectly! Squid ink done right! Winner! Pluma de Cerdo (Pork Shoulder) – Pick a side of your choice from mash potatoes to salad to rice, etc. We had ours with asparagus that’s cooked to a nice crunch. Fat, fresh, crunchy and tender altogether! The pork was super yummy! Very tender and very moist! Must order! Crema Catalana Con Sorbete (Creme Brûlée with Sorbet)- Nope! Never had Creme Brûlée with Sorbet! But this worked pretty nicely! A little crunch with a little cream and a little frozen chill! Pińa Con Yogur (Pineapple with Yogurt) – Lightly grilled and served with frozen yogurt. Sweet juicy pineapple and light tangy yogurt. Sometimes, simplicity is all you need! Churros Rellenos (Stuffed Churros) – These were the first to go! The freshly fried dough sticks were generously filled with creamy chocolate and vanilla cream. Soooo good with a cuppa joe! This is a great place for a fun night out just sipping wine and nibbling on Tapas. Business is good and what they really need is more service staff to handle the crowd. We waited ages for our beverages among other requests. Thankfully the Sangria was yummy and we forgot how frustratingly thirty we were! It’s quite impossible to just grab a small bite here at Tapas Club cuz everything on the menu calls out to you!! But know you’re in good hands so don’t hold back…And Buen provecho!